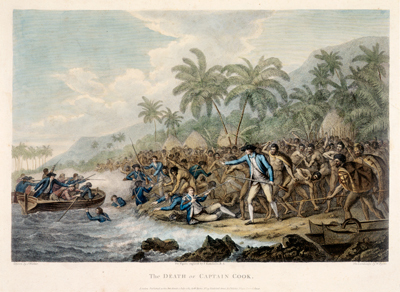 The Captain’s Ghost featured works by three artists who were inspired by the cross-cultural exchanges that occurred during Captain James Cook’s voyages in the South Pacific. 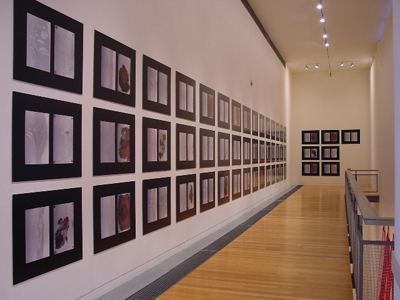 The exhibition brought attention to the complexity of cross-cultural encounter and exchange during this period of exploration. In this exhibition Auckland-based artists Mark Adams and Christine Hellyar, along with Sydney-based photographer Debra Phillips, drew on the reciprocal and transformative nature of cross-cultural exchange. The artists focused on the processes of cross-fertilisation, exposing the seeds that were planted, and the ghosts that remain. 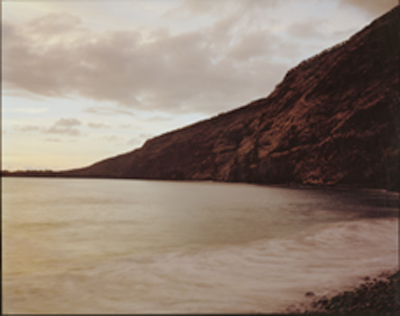 In Cook’s Sites, photographer Mark Adams travels to the places where Cook and his men landed in the South Pacific, including Kealakekua Bay where Cook was killed, and Botany Bay where Sir Joseph Banks’ memorial now lies. Instilling a haunting sense of presence to these sites, Adams photographically commemorates the instant of encounter, defining it as a moment of discovery, violence and mutual reciprocity. In Christine Hellyar’s installation, Cook’s Gardens, the artist explores the significance of cross-cultural exchange in language, culture, religion, and nature. Hellyar brings together a hybrid collection of artifacts, including European domestic items, and period-style dresses. 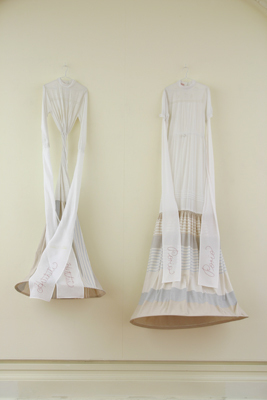 On these dresses Hellyar has embroidered the names of Tahitians who were given these often ill-fitting garments. Cuttings from vegetables that were planted in the South Pacific by Dr. Solander and Herman Spöring are displayed in large test tubes, alluding to the enduring physical presence of these early encounters. The botanical discoveries Banks made during the Endeavour voyage, recorded in the set of plates known as the Florilegium, are central to Debra Phillips’ works. As Juliana Engberg writes, ‘the worlds of old and new, biblical and scientific, botanical and mechanical’ collide as the artist photographically records the front and back of the copper plates that comprise Banks’ Florilegium. In both a scientific and artistic sense, these works explore the systematic processes of collecting, cataloguing and reproduction integral to the quest for discovery during this age of Enlightenment. Accompanying and contextualising the artists’ works was a collection of images, archival material and botanical specimens compiled by writer and curator Ian Wedde. These objects, evidence of these early encounters, revealed the complexity of cross-cultural exchange and its ongoing legacy.